What sparked Ross Barkley's improvement at Chelsea? Danny Murphy said Ross Barkley's decision to leave his home comforts behind and move cities helped forge his success at Chelsea, Danny Murphy told The Debate. The 24-year-old has been a success for Maurizio Sarri's side during this season, performing so well he has forced his way back into the England squad after two years in exile. 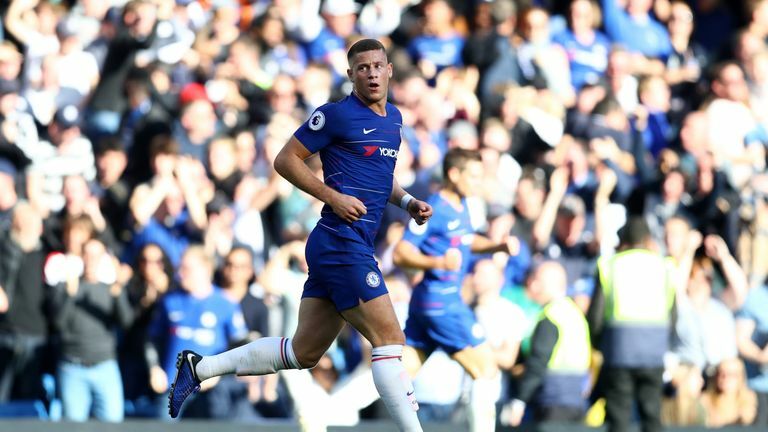 Barkley is expected to get the opportunity to continue his fine run of form when Chelsea host his former club Everton on Super Sunday, live on Sky Sports Premier League from 1pm. Murphy told The Debate Barkley, having been derided in some quarters when he joined the club in January due to his inconsistent form with the Toffees, had been the catalyst for his own improvement because of his willingness to change - and his willingness to uproot himself for the first time in his life. He said: "When you live in a certain area all you life, and you're only used to one way of life, you can get in a comfort zone and a rut, if you like. "There's a higher expectancy from supporters when you're one of their own to be on form, and sometimes maturity in football comes off the pitch rather than on it. He got himself in a few bits of trouble, and maybe he just needed to move out of that. "He's changed his mentality, physically he looks better, he looks hungry, he looks like he's trying to prove a point. It's like he's turned off a new leaf, and fair play to him. It takes a lot of courage. "When I was in Chester and signed for Liverpool, it took me about a year or 18 months to realise I had to move away from the area to avoid certain things, certain problems and temptations. He's benefitted from moving away, the manager deserves credit for giving him a platform, but Barkley deserves the most credit, because he's taken a risk. "There was some negative talk about this move when he was nowhere near the team, but he's scoring goals, beating people and looks a real handful. He's got two great feet and I think his progression overall has been great, and long may it continue." Barkley's happiness to markedly change his style of play has warmed Sarri to him, Liam Rosenior added, with five Premier League starts already to his name this season. "The way Sarri plays, what he's done is seen a player who can fit into his way of playing," he said. "He's halved the number of dribbles he's making and is making more passes. He's got top, top midfield players in there helping him out, and making him a better player - N'Golo Kante, Jorginho and Mateo Kovacic. "He's shown bravery in coming out of his comfort zone. He could have stayed at Everton for his whole career, he went through a little bit of inconsistent form and dropped out of the team, but he got back in it and now he's gone to Chelsea and said he wants to improve, and is reaping the rewards for that. Long may it continue."